What Are Tongue Stabilizing Devices? 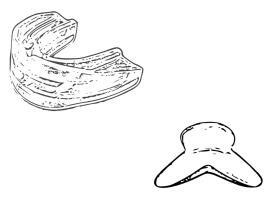 What Are Mandibular Advancement Devices? A mandibular advancement device, or MAD, is a device that advances the jaw forward using the teeth. The mandible is a jawbone and it is advanced forward using this device. A MAD is commonly used to treat snoring an sleep apnea. For Snoring Treatment, Which Is Best For Whom? MADs come in many varieties, most require custom fitting, some do not. Many can be custom fit at home, some need to be made by a dental lab and require a doctor visit. The better the fit, the more effective the device. TSDs generally do not need to be fitted. There are sometimes various sizes that exist in TSDs to accommodate small or large mouths and tongues. A MAD is best for those with some nasal obstruction. If you cannot breathe through your nose, a TSD cannot well work for you. A TSD requires nasal breathing to work in most cases. Both will last about the same amount of time when used regularly but MADs are more likely to be worn at night. In a study conducted on 27 patients who snored 5-7 nights a week 81.8% of the time, MADs eliminated snoring in 40.9% of patients compared to TSDs which eliminated snoring in only 27.3% of patients. Patients using a MAD reported improvement in snoring severity with 27.3% being very much improved and 59.1% being much improved. With TSDs, fewer patients indicated favorable results with 13.6% being very much improved and 13.6% being much improved, 22.7% reported no improvement. In a 2009 study comparing MADs to TSDs, 91% of the patients preferred a MAD over a TSD and they were more satisfied with the MAD. In this study, 27.3% of the patients were able to keep the TSD in for 6 or more hours at night compared to 81.8% for MADs. This indicates that more people prefer MADs to TSDs and that the likelihood of wearing the device for the whole night increases with a MAD. 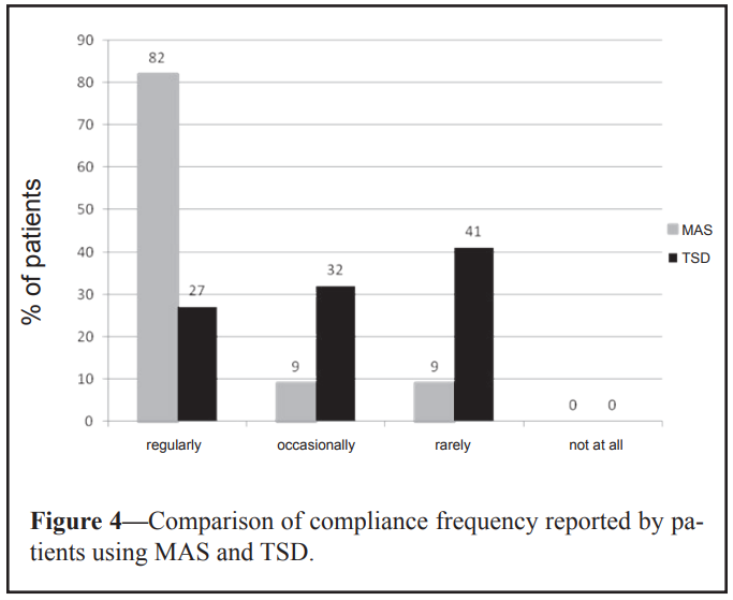 In general, TSDs and MADs (shown as "MAS" - mandibular advancement splint on the chart) perform similarly but patients are more likely to wear a MAD device regularly than a TSD. While both a tongue stabilizing device (TSD) and a mandibular advancement device (MAD) can stop snoring, a MAD is usually better for those without dentures or recent dental work. A TSD will not work well if the person using it has blockage in their nasal passageway because the device usually requires breathing through the nose only. If a person has temporomandibular joint disorder (TMJ), a TSD is a better choice than an MAD. A TSD does not rest on the teeth or keep the jaw in a certain position, making it a better solution for a person with jaw problems. The best device is relative to the person who needs to use it but studies indicate that a MAD is more comfortable to wear and there are more types of them to select from.